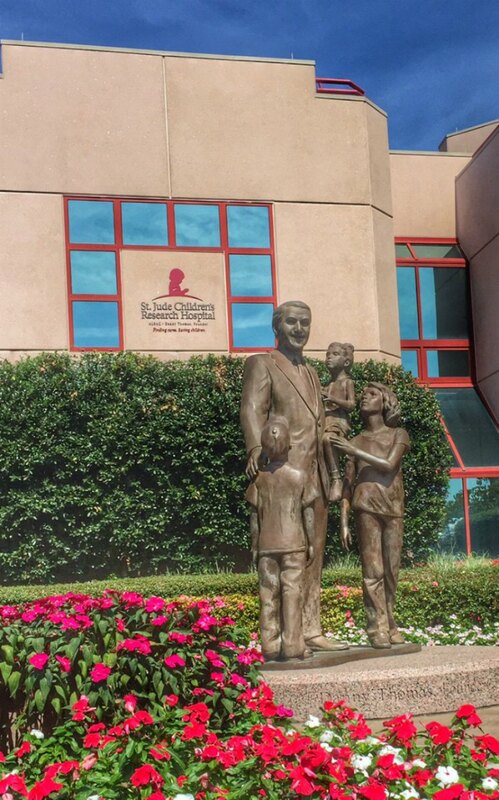 Just recently, I had the incredible pleasure of traveling to St. Jude Children’s Research Hospital in Memphis, Tennessee. 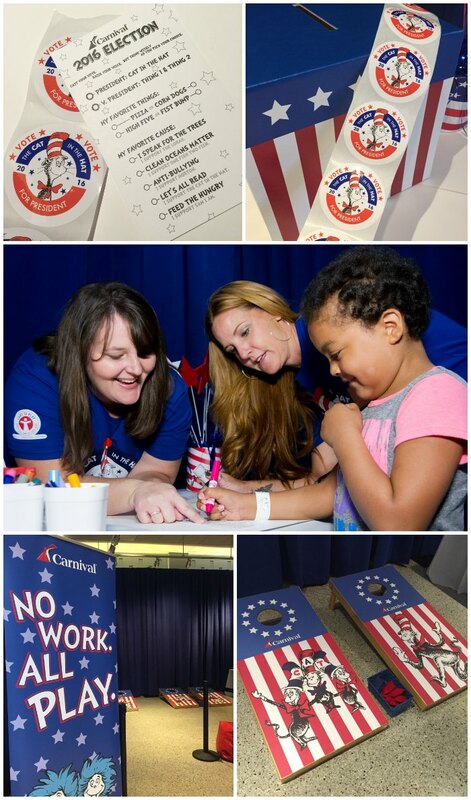 I was there to participate as a volunteer for the Carnival Cruise Line Day of Play for the kids at St. Jude. It was my first trip to Tennessee and my first experience with St. Jude! And, it’s hard to put into words how amazing the experience was…but I’m sure going to try! If you don’t know about St. Jude, you need to! The work they do there is INCREDIBLE! Having seeing it first hand, I want everyone to know what an amazing place this is! I thought I knew about St. Jude before going to visit the hospital, but turns out I barely even knew anything. If you’re like me, you probably know that St. Jude does amazing work in trying to cure childhood cancer! But it’s so much more than that! The families of children being treated there DO NOT PAY! Can you even imagine what an incredible blessing that is?! They don’t receive a bill for their treatment, their housing, or their meals. It’s all taken care of! Which means that it costs A LOT of money to keep the hospital running – in fact, it costs just over 2 millions dollars PER DAY to run St. Jude! So, donations from both individuals (which account for over 70% of the money that comes in) and from corporate partners are vital! And that’s where Carnival Cruise Line comes in! 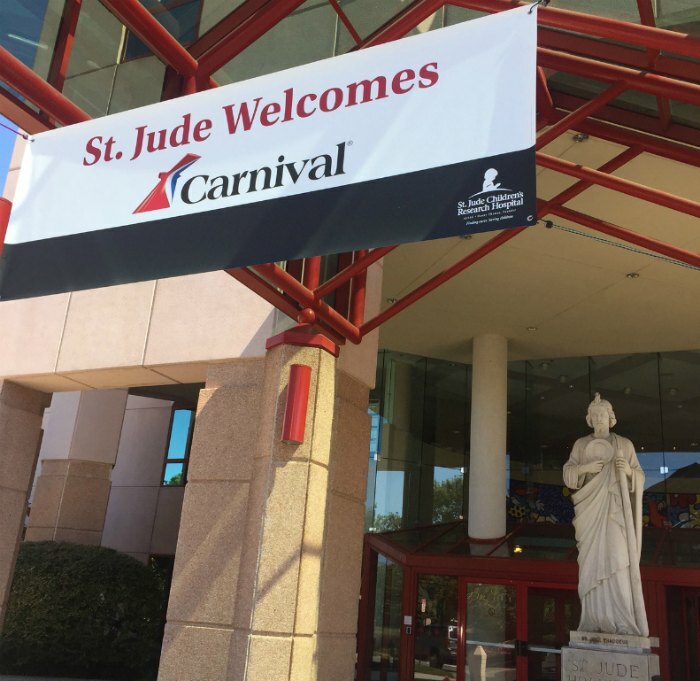 Carnival partnered with St. Jude a few years ago and is St. Jude’s Official Celebration Partner! Having just recently experienced our first Carnival Cruise this past summer, I can tell you that Carnival is perfect as a celebration partner. They know how to have fun! In addition to serving as the Official Celebration Partner of St. Jude, the cruise line conducts fundraising activities throughout the year. These include a fun dance activity called Groove for St. Jude and the Beary Cuddly program where kids can make their own stuffed animal with proceeds benefiting the hospital. Additionally, when guests purchase a designated bakery item from the line’s on-board shops or prior to their cruise on carnival.com, Carnival donates a portion of each item sold to St. Jude Children’s Research Hospital. Through these efforts, Carnival has already raised over $8 million and has a goal of raising $10 million by 2020. Carnival also helps bring some fun to the families and kids at the hospital by hosting special events. “Throwing up is yucky. Taking medicine is super yucky. Cancer is mean and yucky”. So hard. Amidst all the yucky though, there is hope here at St. Jude. There’s beauty here. There’s inspiration here. And with all of that, there needs to sometimes be some fun! 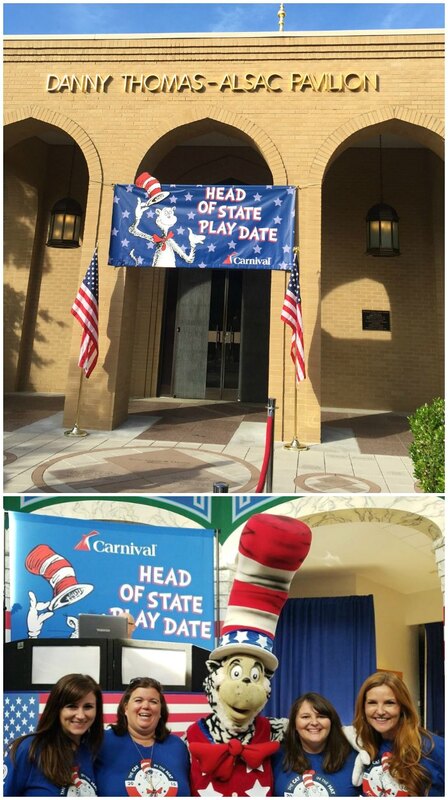 And thanks to Carnival Cruise Line, there was just recently opportunity for kids and families at St. Jude to have some fun with the Cat in the Hat “Head of State Play Date”. 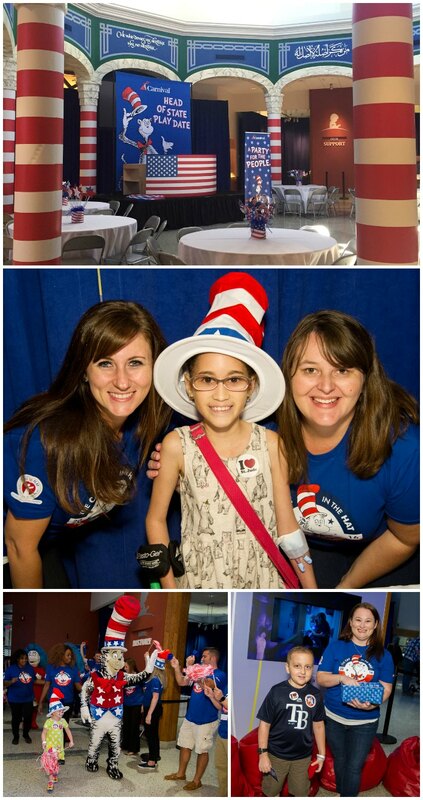 And I was there with some of my best blogging friends as members of Carnival’s official “Seuss Secret Service”! 😉 Amy from MomSpark, Tammilee from Tammilee Tips, Danielle from Extraordinary Mommy and I were thrilled to be a part of it! The whole set up was adorable. There were fun themed foods (ike corn dogs, pizza, funnel cakes, fresh fruit, blue or red punch, etc.) and a bunch of different stations for the kids & their families to rotate through – A craft station to decorate Cat in the Hat flags, a photo booth, a bean bag toss game area, a dance party, and our station, the voting booth! We helped kiddos cast their vote for Cat in the Hat for President and Thing 1 and 2 for Vice President (it was a rigged election, I tell you!). Additionally, they could vote for their favorite things – between pizza and hot dogs, high fives or fist bumps and favorite cause based on a Dr. Seuss book. We helped them fill in their ballots, cast their votes, and get their “I voted” sticker (which were much more fun than the real thing for sure). It was amazing to be a part of and a reminder for me of my former teaching days! Seeing the kids’ smiles, cheering for our new buddy Cameron who was rocking the bean bag toss (and kept coming back to play again and again just as sweet as can be), joking with the kids about the rigged election, giving fist bumps and high fives – this was an experience I will always cherish. And if YOU are looking for a way to get involved, please consider learning more about or donating to St. Jude by visiting their website (stjude.org) or following on social media – facebook.com/stjude and twitter.com/stjude! You can get look for some of those fundraising opportunities on your next Carnival Cruise as well! THANK YOU, Carnival and St. Jude, for inviting me to take part! Disclosure: I was invited to take part in this event by Carnival Cruise Line. As such, they sponsored my travel and accommodations. What an amazing experience and such an amazing place! Truly a great adventure and experience! I loved it all, thank you for sharing. The children’s smiles says it all. What a blessing. This is incredible! 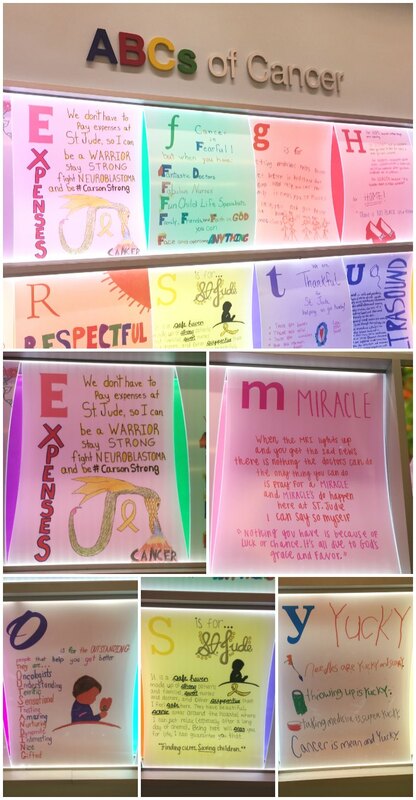 St. Jude makes such an amazing difference for families going through unthinkable tragedies and it’s just awesome how much Carnival supports that initiative. What a great feel good story! Wow, I had no idea that the families didn’t pay! What an incredible opportunity for those families. I can’t imagine all involved in keeping a place like that running. What an awesome service! Will be showing this to my family as a place to donate our money for sure! This is so heartwarming, Sara! What an amazing place, I had no idea!